I usually have some things that I like to do on Saturday mornings. After I wake up and eat a light breakfast, I leave home for a strength conditioning workout at the American Family Fitness Center. Then, I travel around the corner for iced coffee at Starbucks. The barista's usually fix my coffee when they see me walking across the parking lot. Sometimes, I can hear them yell, "It's a grande iced Charles!" - much to my amusement. After drinking my a "grande iced Charles" and reading the local newspaper; I mentally make a grocery list as my most important errand comes to mind. The liquor store. Some people call it the "licka sto." Sometimes, things can hinder you from accomplishing your tasks. 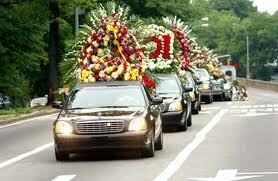 Personally, it's always a funeral processional on an early Saturday afternoon. While traveling to the liquor store, I began to wonder if everyone had died on the same day and if their survivors had decided to hold the funeral service on Saturday. However, I guess it is a popular day for weddings and funerals. "Every Saturday, there is a funeral. It must be planting season," I said aloud. Over the next few Saturdays, I repeated my weekly routine complete with waiting patiently as all of the cars creeped passed me at the traffic light or stop sign. There are at least two funeral processionals that interrupt my trip to the "licka sto" each week - well almost. One early Saturday afternoon after experiencing a long and draining week at work and ready to finish my final errand for the day; a 75 car processional interrupted my travel route - yet again. So, as the old saying goes, "If you can't beat them join them." Trying to think on my feet, I decided to turn on my vehicle headlights; turned off the noisy radio; reached for my handkerchief to wipe my fake tears; and then I eased behind the last car in the processional. It was refreshing and exhilarating. I had the experience of running all of the traffic lights (somewhat legally) until I reached my final destination. I hadn't been in a funeral processional since Daddy died months ago. Plus, a bottle of Jim Beam bourbon was waiting for me in the far left corner of the "licka sto." Now, I make sure my headlights are in good working order, and I always keep a handkerchief in the front seat - just in case. As I told my Facebook friends, I may purchase two funeral flags and a yellow flashing light for my vehicle. I will just use them on Saturday afternoons - of course. Charles! You are a RIOT! Loved it! As always, you kill me! Pun intended!